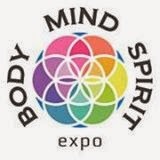 I will be one of the opening lecturers for the Body Mind Spirit Expo November 1-2, 2014! I went to the BMSE a few years ago and always in the back of my mind, planned to have a booth someday. I'm so excited to try something new this fall! Love a deal? Here's a coupon for entry! Woo-hoo!